As a Southland-born and bred fella among the no longer existing cane fields, let me tell you about roti in South. A proper roti spot has no particular color, the shop color is usually the leftover paint from last year’s Christmas cleanup. The shop must have a counter, a barrier between the owner and patrons that resembles a large table-top. I remember this because in the parlor where I lived as a small boy, I sat on the counter and listened to stories from Mr. Crick about “dong d main” (i.e., Venezuela). A roti shop sells roti. Plain roti or roti with this dat and the other. Don’t know where the term “roti skin” or “sada bake” came from. If you say “pepper roti” you are roti-cally correct. Pepper roti is usually found in Hindu prayers where when the fellas finish cook, remaining vegetables are used to make the last roti. Obviously, the main ingredient is pepper. If you taste a pepper roti, it “krips” and nice and real hot, Scorpion hot. #1 – Good roti shops include Mona’s in Marabella, opposite the Police Station. Next time you go to make an accident report, buy a roti one time. Mona’s is well-known and you can’t go wrong here. Link to Mona’s pictures. #2 – Shaffies Catering in Marabella near the Marabella cemetery makes roti on order. 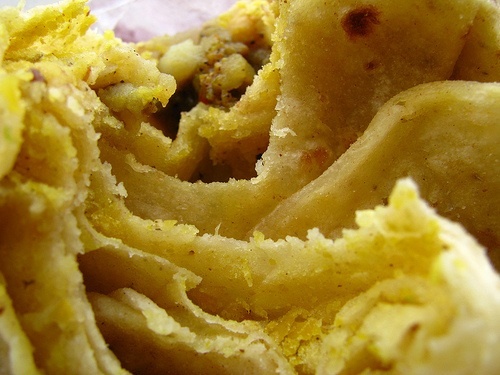 The buss-up-shut is silky smooth and delicious – you could eat the roti by itself. This is mainly due to the ghee. One roti could feed about 5-6 adults. # 3 – Staying in Marabella, there’s also the well known Amin’s Roti Shop. Here you get buss-up-shut and dhalpuri roti. (868) 658-1691. #4 – On Todd Street, Les Efforts East, Sando. S&D Roti Shop is jam up every day at lunch time. You lucky if you get roti or food after 1:30pm. Roti, dhal and duck is real trouble. S&D is very breezy and open, real cool and relaxed ambiance. #5 – On Matilda Road, off Matilda Junction in my hometown Princes Town, is Quilly’s – also known as “Kresh” to anyone up there. Great tasting roti with chicken, goat and duck. And, usually available up to about 4pm. Remember the calypso with “She gone Matilda Road, She gone to look for obeahman,” that is where I talking about. #6 – Karamath’s Roti on Coffee Street, Sando. This roti shop is the mainstay of San Fernandians and has been around since! They’re open late in the night and is the only place in Sando you could get home-food so late. Here you have the interesting ‘Piper Roti’ which is basically chicken neck and back. I don’t know the etymology but I suppose you had to be real tight to eat this. (868) 653-1142. Check the comments below for additional recommendations and don’t miss our post on the top roti list for Trinidad! Tags: Roti Trinidad, Trinidad Tobago Food Finds. Bookmark the permalink. Pingback: What to eat in Trinidad in 72 hours : Eat like a local! if is anyting karamath is noted for is de scent. yuh cyah teef tuh eat dat nah. and dat doh even mean is a good smell…….is jus ah KARAMATH ROTI SMELL. In defense of the Karamath presence in the list, d man say yuh “had to be real tight to eat this” LOL. But iz true, as much as d taste eh all dat, real ppl does flock to there. Karamath?? Yuh was winning in Marabella. Try Farouk’s next to Faiz in Marabella. To tell yuh how good they are, on Saturday and Sunday Mornings they have a van that does come out further down by Amin’s side and sell plain dhalpourie and paratha. It so much in demand!! These places are truly the best in south! The Todd Street roti is da business. Karamath – agree with the masses. It is nasty. Yes, I also do not know how Karamath made this list. Ali’s in Springvale/Vistabella is far better. Roopram Roti in Cocyea just next to Aquariam Resturant is really a winner, the texture of that Dhalpourie is really soft and lovely. Their sides are also very well seasoned and delicious. I agree with the first five options especially the P Town Roti…being ah P Town girl myself but I would rather die than eat roti by Karamath !!! Curry is raw and horrible tasting..fuh real no joke! nice page….S&D is a winner…….cane fields still do exist though….. Many thanks to the wife who sent me this link. lovely bits of info, especially the six recommend roti shops in South trinidad, almost made me grieve as though someone’s died!. The reason being, I don’t live in trinidad anymore and my nearest roti shop is miles & miles away!.